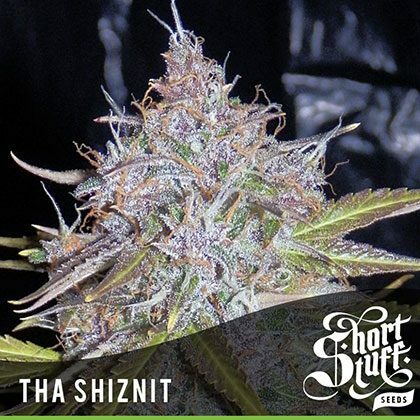 Dope-seeds are proud to present ‘that shiznit’ from the Shortstuff seedbank. This strain really reaches a new level in autoflowering excellence with THC levels of over 20% and yields which are unheard of! Tha Shiznit produces medium to large, plants which can easily surpass 1m indoor. She has larger internodal spacing with chunky buds forming at each internode. She will generally have a thick central stem and a dominant main cola, large fan leaves and thick clustered buds. This plant is extremely resinous as you would expect for a strain with so much Kush heritage and in a percentage of plants you can expect to see some pink and purple coloration. This strain was tested at Spannabis 2014 and recorded THC levels of 20.6% which for an autoflower strain is quite incredible. These high levels of THC mean Tha Shiznit is one of our most potent straisn and produces a powerful cerebral high that keeps you chatty and motivated. Tha Shiznit is a very straightforward strain which can handle plenty of nutrients and requires little attention. If grown with some care she can easily produce 60g+ per plant. Tha Shiznit is part of our Boutique Line of cutting edge Autoflowering cannabis genetics. The Boutique Line contains the most up to date autoflowering genetics which are pushing the boundaries of what can be done with autos. All the strains in the Boutique Line are big, tall, heavy-yielders and have been produced in-house by Shortstuff’s master breeders.